Known as The Entertainment Capital of the World, Las Vegas tends to be known more for the adult-oriented attractions than those directed at children. If you’re looking for an ideal spot for your next family vacation, you may be surprised to find just how much Las Vegas has to offer for kids and families. These are ten of the most exciting, kid-friendly attractions in this major resort city. Red Rock Canyon Natural Conservation Area (Las Vegas, 89124) – Joshua Trees, fossils embedded in cliffs and petroglyphs are only a few of the natural wonders you’ll see at Red Rock Canyon, which also features a high-end Visitor Center built in 2010 filled with exhibits, activities and interactive installations. The Visitor Center also offers organized hikes, which can be arranged in advance and are active, educational fun for the entire family. Siegfried & Roy’s Secret Garden & Dolphin Habitat (Las Vegas, NV 89109) – Inside the Mirage Hotel is a stunning sanctuary that houses tigers, leopards and lions in an exotic setting, filled with plants native to the natural habitats of these graceful creatures. Alongside the Secret Garden is the Dolphin Habitat, an educational and research facility. The dolphins in the Siegfried and Roy habitat aren’t trained and do not perform for the public, but visitors can watch the staff of trainers as they work with the marine mammals and get an up-close view from the underground viewing windows. Lied Discovery Children’s Museum (Las Vegas, NV 89101) – Whether they’re simulating adult life with a job, paycheck and chores in the Green Village Pavilion or pretending to be an Old West miner in the Desert Discovery station, kids are sure to be endlessly entertained at Lied Discovery Children’s Museum. Because the facility is the largest educational institution for kids in the area, there are a staggering number of possibilities to choose from, all in one attraction. Bonnie Springs Old Nevada (Blue Diamond, NV 89004) – Skip the false fronts of simulated Old West towns and head to Bonnie Springs, which is filled with actual shops, a saloon and a museum. There are staged shoot-’em-ups daily, a petting zoo, a miniature train and stagecoaches to explore, which will keep kids entertained throughout the day. Be sure to check the events schedule, however, to avoid the mock “hangings” that are part of the staged melodrama. Gilcrease Nature Sanctuary (Las Vegas, NV 89131) – Part petting zoo and part sanctuary, Gilcrease allows kids to get up close and personal with a variety of animals, exotic birds and reptiles. If youngsters in your entourage need to burn off a bit of excess energy, there are also walking trails to take advantage of. 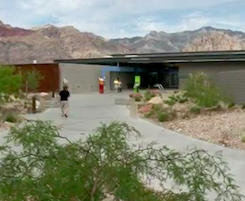 Las Vegas Springs Preserve (Las Vegas, NV 89107) – Over the 108 acres of the Las Vegas Springs Preserve, you’ll find several museum galleries, a Desert Living Center that spans five buildings, a living bat cave, flash flood simulation and a recreated Wooly Mammoth skeleton partially embedded in the sand, which kids are encouraged to climb on and explore. Clark County Museum (Henderson, NV 89002) – Timeline exhibits allows visitors to look at artifacts and photographs depicting the history of Las Vegas, with plenty of hands-on exhibits for kids to get in on the fun. The Heritage Street collection of reproduction historic homes is a particular favorite of youngsters, and is adjoined by a 1918 Steam Switch Engine built by Union Pacific Works and once used for both passenger and freight trains. The Pinball Hall of Fame (Las Vegas, NV 89121) – Advertised as the “World’s only and largest pinball museum,” The Pinball Hall of Fame features over 200 machines spanning almost sixty years of pinball history. Visitors can play the games, and all proceeds from this nonprofit entity are donated to charity. Mandalay Bay Shark Reef (Las Vegas, NV 89119) – Grab an audio wand and meander through tunnels and past tanks as a feed of recorded information allows you and your children to take a self-guided tour that’s still informative and educational. If Shark Week is cant’-miss television in your house, you’ll definitely want to make sure that you visit this gem. Ethel M. Chocolate Factory & Cactus Garden (Henderson, NV 89104) – Tour a working chocolate factory to learn first-hand how the sweet treats are manufactured and packaged for sale, then take the sample you’re given at the end of the journey to the nearby Botanical Cactus Garden. Check out more than 350 varieties of cactus, succulents and other desert plants in a self-guided tour. While you may consider the major casino-hotels adults-only territory, there are actually a wide variety of family-friendly attractions on-site at many of the primary resorts. Be sure to find out what, if any, activities and attractions exist in your chosen hotel for kids, and keep an eye out for things to do as a family off the gaming floors in the major casinos. It may also prove wise to keep the staggering number of shows and live performances in mind, as some of them are quite suitable for the smaller set.